Apple is hosting an education focused event in Chicago where it will announce new products and services. The company is launching a brand new 9.7-inch iPad with a faster processor and Apple Pencil support. Today’s Apple event in Chicago was about more than just showing off new hardware and software in the classroom — the company was reasserting itself as a major player in education. The category has long been a lynchpin in Apple’s strategy — something that Steve Jobs held near and dear. Any ’80s kid will tell you that Apple was a force to be reckoned with — Apple computers were mainstays in computer labs across the country. It’s always been a good fit for a company focused on serving creators, bringing that extra bit of pizzazz to the classroom. In recent years, however, there’s been a major shift. The Chromebook has become the king of the classroom, thanks in no small part to the inexpensive hardware and limited spec requirements. Based on Google’s early positioning of the category, it appears that the Chromebook’s classroom success even managed to catch its creators off-guard. The company has since happily embraced that success — while Microsoft appears to have shifted its own approach in response to Chrome OS’s success. Apple’s own responses have been less direct, and today’s event was a reconfirmation of the company’s commitment to the iPad as the centerpiece of its educational play. If Apple can be seen as reacting, it’s in the price of the product. Gone are the days that schools’ entire digital strategy revolved around a bunch of stationary desktops in a dusty old computer lab. But while education has been a piece of the iPad strategy since the product launched eight years ago next month, the tablet was long price-prohibitive. The company has addressed that through school discounts and lowering the overall cost of the line, as the tablet market has started to stagnate, but the last couple of upgrades have dropped pricing down to a far more approachable $299. A one-iPad-per-child approach is still out of the realm of plenty of public schools, but it’s easy to see how the product could be appealing for school IT managers looking to roll out the iPad cart to classrooms. And additions like Managed Apple IDs have made it easier for multiple kids to share the same device, as a cost-cutting measure. Along with devoted educational software, the company demonstrated how existing apps like Clips and Garage Band can be repurposed within the educational context to help bring a level of multimedia interactivity to the learning process. The company even sat us down in classrooms today to walk us through some of those projects. Of course, right now, the market is Google’s to lose. The company reportedly controls around 60 percent of the market. Much like Android, the heart of Chrome OS’s approach is an embrace of third-party manufacturers, which have helped keep the cost down. Schools with tight budgets can pick up a dirt-cheap Chromebook for $100-$150 less than an iPad. It’s easy to see how that’s an appealing proposition, especially when broken units are just par for the course in the hands of students. In spite of its success, Google’s certainly not an island. Yesterday’s announcement of the first Chromebook tablet was both a response to Apple’s involvement in the space and a preemptive strike against today’s event, though the new Acer device is actually $30 more expensive than Apple’s educational discount. The company sort of shot itself in the foot on that one, but expect to see more competitively priced slates from other hardware partners. 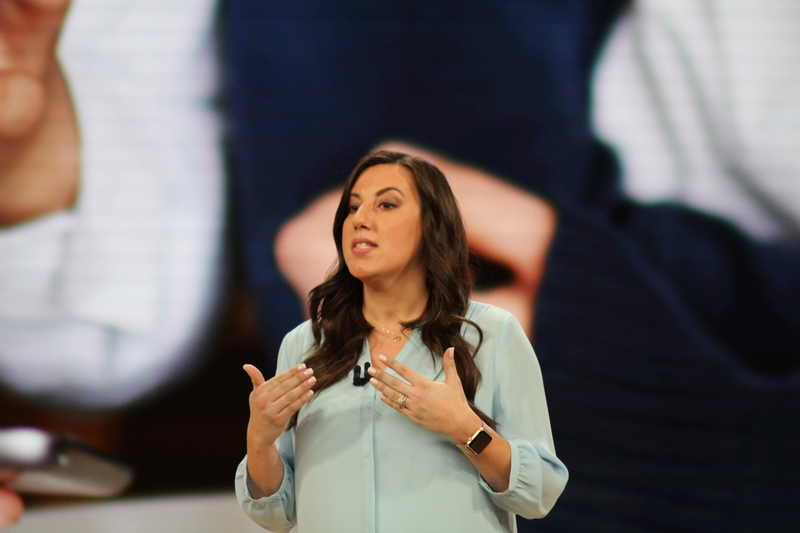 Microsoft held its own education event in May of last year, showing off its solution to Chrome OS. Thus far, however, Windows 10 S has been kind of a mess, thanks in no small part to some pretty convoluted messaging on the company’s part. The company plans to streamline things a bit by making 10 S a mode inside of Windows 10. The idea is basically the same, either way, offering a stripped-down version of the operating system that can be locked down from outside apps, so teachers can make sure nothing unseemly makes its way onto the device. It takes less of a toll on the hardware, with the company introducing a new line of PCs starting at $189 — a clear swipe at the Google’s dominance. In fact, the company came out and said as much in the accompanying press material, saying the products were “the same price as Chromebooks, with none of the compromises.” And while Google’s online office applications have grown in popularity, Microsoft software is still nearly ubiquitous in offices, so there’s something to be said for prepping kids for the real world through use of such applications. Apple didn’t livestream this morning’s education event at Lane Tech High School in Chicago, so reading along live was the next best thing. Thankfully, for those who weren’t crammed into the auditorium seating with the rest of us, the whole shebang is now online and viewable through Apple’s site. 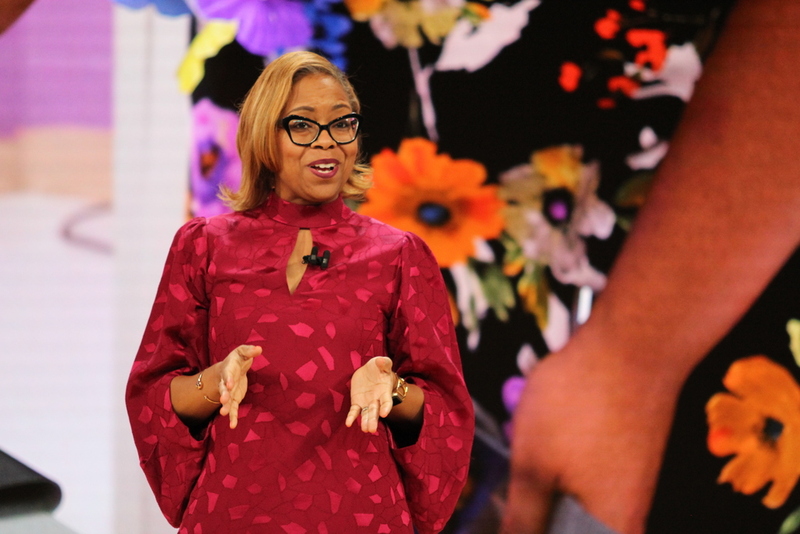 The event was, as expected, focused entirely on Apple’s education play, as the company looks to reassert itself in school in the wake of the massive success of Chromebooks. Tim Cook and company took a deep dive into the software solutions aimed helping teachers streamline the in-class iPad usage, along with the various ways in which mainstream Apple apps like Clips and Garage Band are being used in the class. And then, of course, there are those new, cheap, iPads. Apple’s ebook creation tools – first launched in 2012 – have long played an interesting if minor role in the ecosystem. While Amazon has the indie book world sewn up with Kindle Direct Publishing, the desktop-based iBooks Author has always been the multimedia alternative and a favorite for folks creating one-off texts. Although there are no clear numbers (the last announcement happened in 2015 when Apple claimed seeing 1 million new iBooks users per week), there is some evidence that it behooves indie authors to at least support the platform and with the new iPad Author tools it looks like creators – and educators – will be able to create and distribute their own iPad-based texts. The app, which is part of Pages and is called Digital Books in new iOS parlance, allows users to create multimedia books just as they would create regular documents. The app also supports group editing and multiple templates allow you to flow images and text into the app seamlessly. The new application is a direct attack on the current popular educational authoring tool, Google Docs. Anecdotally, the Brooklyn schools my kids attend all finish and turn in their homework via the schools own private Google accounts, a fact that probably keeps iOS educational team leads up at night. This move from a dedicated desktop app mostly aimed at indie authors and higher education to an iPad app aimed at small groups and, presumably, elementary and high school teachers who want to produce their own lightweight content, is a step in the right direction. Amid a flurry of educational-related announcements at Apple’s press event this morning, the company also unveiled a new feature in its learn-to-code app Swift Playgrounds, that will help teach a younger generation of iOS developers how to build AR-enabled apps. Apple has been heavily pushing augmented reality and its ARKit for developers, as the technology is expected to usher in a whole new ecosystem of smarter apps that can interact with the real world – whether that’s Pokémon-style games, apps that help you pick out your next sofa by visualizing it in the room, apps that animate real-world objects, help you learn, or just entertain. Now Apple wants to encourage novice developers to get into AR, too. Swift Playgrounds was first introduced in 2016 as a new tool for teaching kids to code. The app ships with a number of basic coding lessons and challenges, but with a more graphical and engaging interface than some other learn-to-code apps had in the past. It’s also distributed as an iPad app – meaning it’s ready for schools where iPads are used in the classroom. Today, Apple highlighted AR-focused lessons in Swift Playgrounds. In one example shown on stage, kids could program an animated character to move through a 3D virtual world as a part of a game. AR would allow the animated character and virtual world to be placed within the real world, by way of the iPad’s camera. 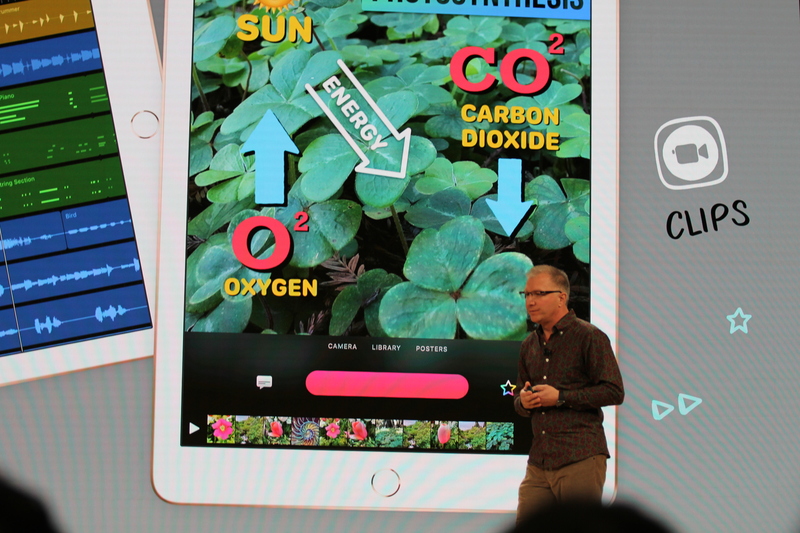 The addition of the AR module to app was part of a larger “Everyone Can Code” agenda highlighted several times throughout the event, with a focus on how Apple’s tools can help. The larger news from this morning was the launch of a low-cost iPad with support for Apple Pencil – the company’s effort to combat Google Chromebook’s growing traction in schools. Apple didn’t say when Swift Playgrounds would add the AR module, or if it already had ahead of the event. Apple is holding a press conference right now in Chicago. And the company unveiled a brand new device — well, sort of. Apple is going to sell a brand new 9.7-inch iPad that works with the Apple Pencil. 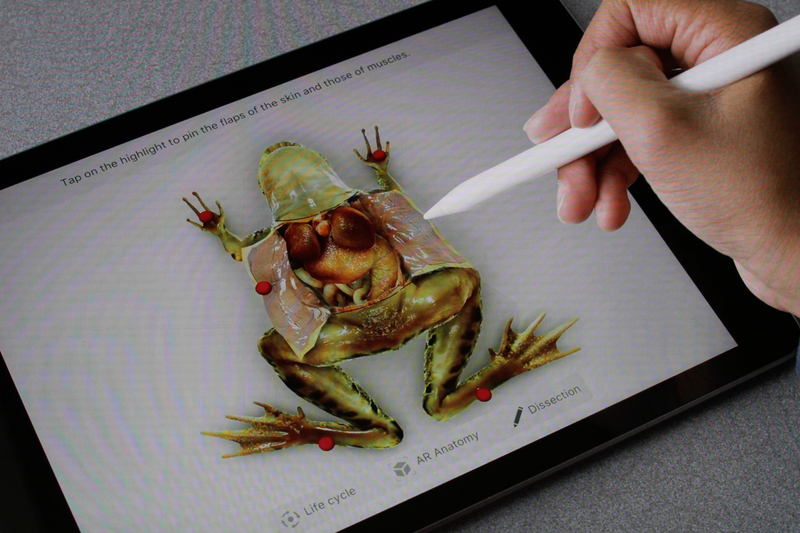 Before today, only (more expensive) iPad Pro models could take advantage of the Pencil. Today’s new iPad will cost $329 for regular consumers. Schools can buy it for $299, just like the previous 9.7-inch iPad. Based on the introduction video, it looks and works just like the existing 9.7-inch iPad. The bezels are identical and there’s a Touch ID sensor. Apple Pencil support is the only thing that seems new so far on the hardware front. Existing iPad users will also get new features as Pages, Numbers and Keynote for iOS are all going to be updated to support the Apple Pencil. 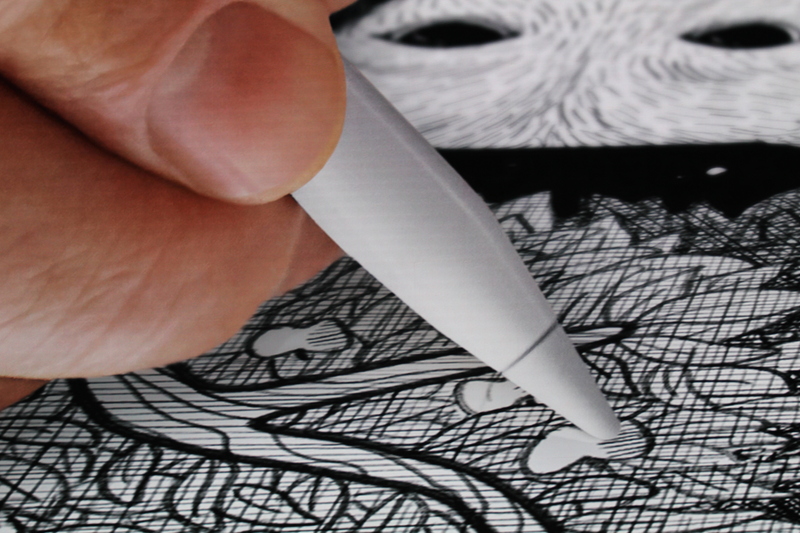 It’s surprising that those Apple apps haven’t supported the stylus yet, but now it’s possible. This feature is going to be called Smart Annotation and is going to be available as a beta. Teachers could use it to grade papers for instance. Apple showed some tech specs. This new iPad should have an LTE version, an 8MP camera, all the sensors you’d expect in an iPad and an A10 Fusion chip. This chip first appeared in the iPhone 7. This sounds like a nice upgrade from last year’s iPad but not a true departure from this product line. Apple also said that there are 200,000 education apps in the App Store right now. The company is trying to position the iPad as a more capable device against Google Chromebooks. And in order to attract schools, Apple is offering 200GB per iCloud account instead of 5GB of free storage. Apple held an education focused event in Chicago today at Lane Technical High School. CEO Tim Cook took the stage and began his announcements with a nod to the student marches that occurred this week in support of gun control. Cook praised Lane Tech High for having more PHDs coming out of it than any school in the country and highlighted its programming and robotics efforts. Cook highlighted Apple’s efforts to increase coding efforts and opportunities to vocational schools and high schools including the City Colleges of Chicago with Swift and Swift playgrounds. Cathleen Richardson ConnectED Program Development Executive at Apple works with classes and teachers to put Apple devices into classrooms. She took the stage to give some examples. The program is clearly focused on Apple positioning itself as a global supplier of educational instruments and processes to classrooms. Programs in China and London were highlighted. This event should be viewed in the context that according to FutureSource, new machines running Google software accounted for about 60 percent of what U.S. classrooms received. Apple’s iOS held 12.3 percent and its MacOS had 4.7 percent. 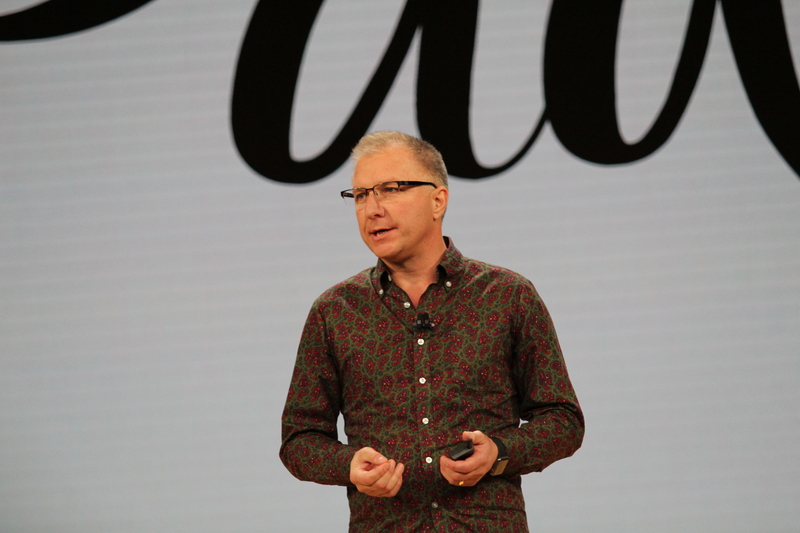 Apple’s Greg Joswiak took the stage to talk about iPad. Joz hasn’t been out on the platform for a hardware launch in a while. He continues the thread of talking about iPad in classrooms allowing students to use them for robotics, music and other kinds of projects. Joz quotes 200,000 ‘apps for education’ on the App Store. Cassie Williams from Woodberry Down Primary School in London comes on the stage to talk about iPad being implemented in the classrooms that she teaches in. Up to this point we’ve gotten a lot of Apple talking points about iPad and Apple in schools, basically. Now, we get a new 9.7″ iPad focused on the education market that can use Apple Pencil just like iPad Pro. Apple also introduced a new version of Pages, Numbers and Keynote that support Apple Pencil drawings and editing. Apple also previewed a feature called Smart Annotation that can mark up a student’s paper right in the Pages app. This feature is still in beta. 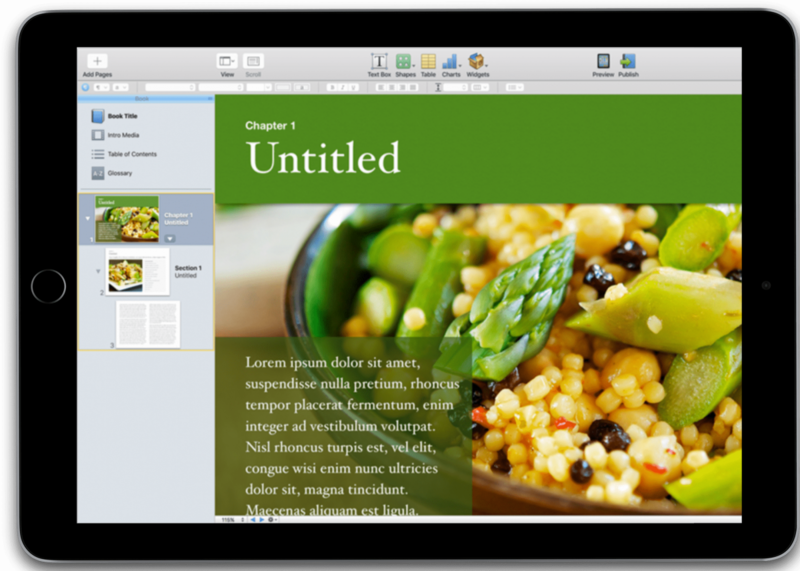 Digital book creation also comes to iPad with this new version of iWork. Apple’s new iPad 9.7″ uses the A10 fusion chip appears in the new iPad. Joz also specifically mentioned that this was more powerful than many Chromebooks. The fact that he chose to mention Chromebooks specifically is surprising, but not shocking given the above context. This is the war that Apple is waging in the classroom. The iPad is AR capable, and he highlighted some apps that allow students to view museum pieces and artwork. Another app lets students modify interactive landscapes and view them in augmented reality. 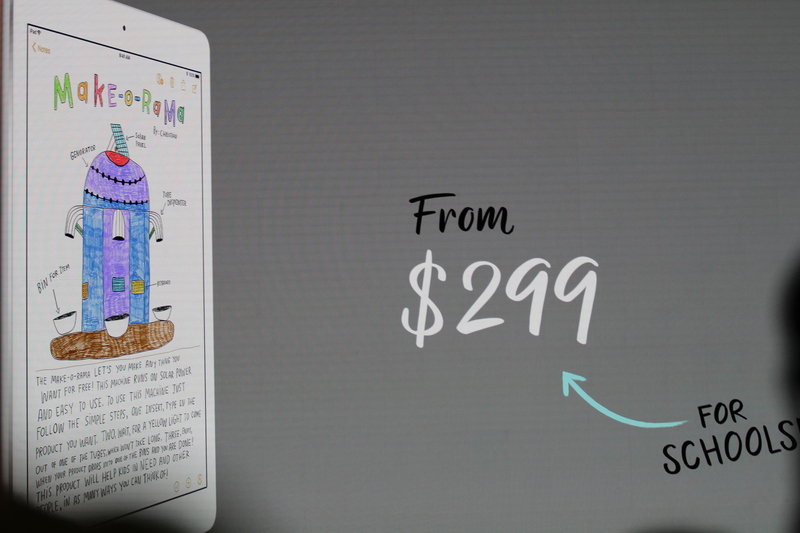 The new iPad is the same $329 for consumers and $299 for schools. For sale this week and new iWork apps available this week. Starting today, student Apple IDs come with 200GB of iCloud storage, up from 5GB. 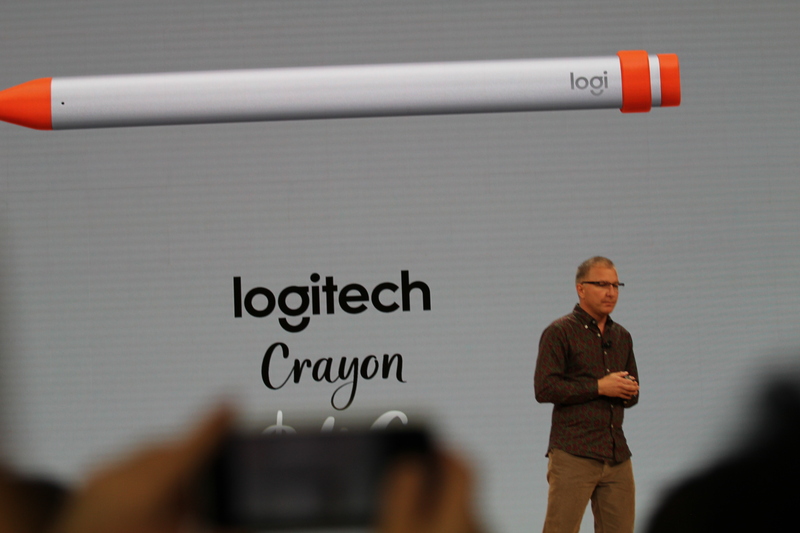 Some new accessories come for the iPad too like Logitech Crayon, a $49 Pencil alternative for schools. Now we’re on to teacher-focused tool announcements. 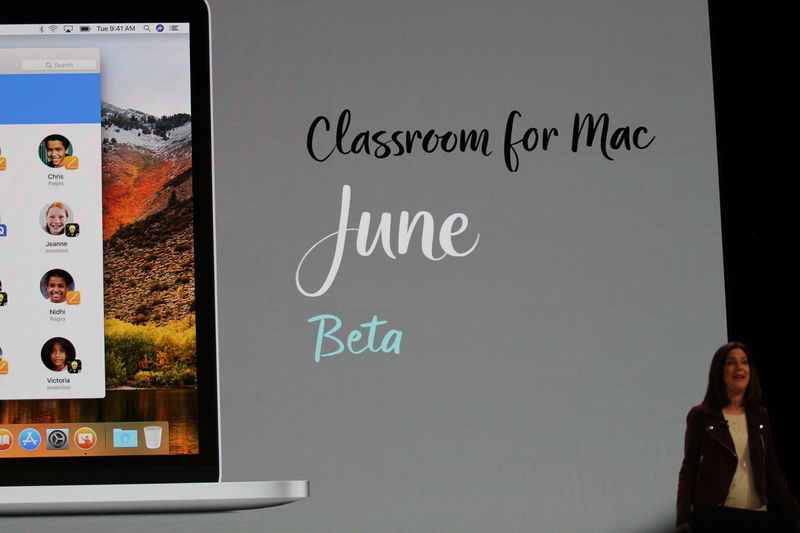 Classroom, the iPad app that lets teachers manage their students and classrooms is coming to the Mac. It’s available as beta in June. There’s a new app for teachers too, called Schoolwork. Schoolwork is a cloud based app that lets you assign handouts, apps and assignments to students. It lets you track handouts for the class and send them. In addition, Schoolwork lets teachers assign a specific activity inside of an app, instead of just a whole app. This way they can dive into how a student is completing activities within an app as well, along with detailed views of how the whole classroom is doing in these activities. Privacy is emphasized here. 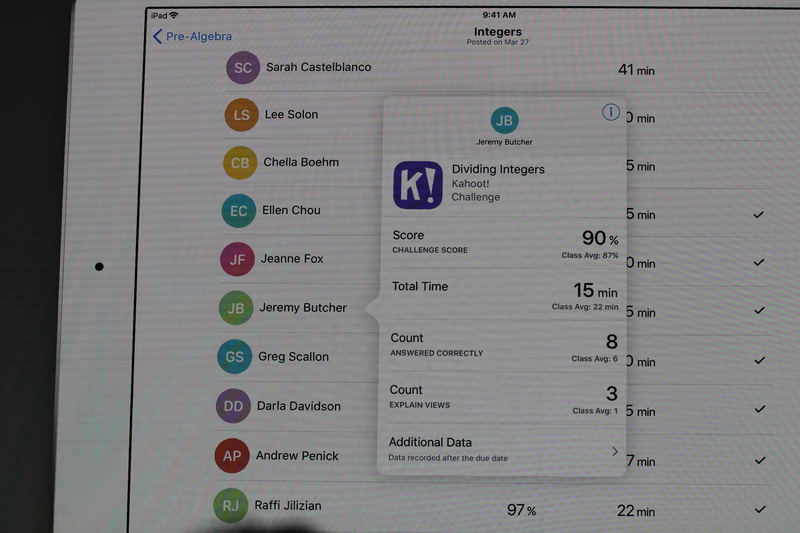 Teachers can see student activity but Apple cannot. The data stays within the system, inaccessible to Apple. Subtext: unlike some other companies. Apple is updating Swift’s tutorials as well with a new module that allows students to create augmented reality apps and experiments. Kasia Derza from Mariano Azuela Elemetary in Chicago came on stage to talk about coding in the classroom. She says she initially used block-based coding tutorials, which worked fine but has transitioned to Swift Playgrounds because there is a more direct correlation between common tasks and coding. Playgrounds is a strong advantage for Apple in the learn to code space as there’s no other tool that’s as advanced and that also uses the exact language used to build a major platform’s apps. We’re honestly back into the evangelism and classroom examples portion of this presentation, which has been very heavy with teachers saying how powerful and exciting and enabling various Apple apps and products are. Teaching kids with apps, teaching teachers to teach kids with apps, etc. It’s all very inspiring and wonderful and great – and I’m not being snarky – but it is getting to be a bit much all in one lump. I love that kids are getting a more technology-rich education and Apple’s software is certainly far, far more robust these days than it used to be for the classroom. I’d certainly love to use the tools if I was a teacher or learn this way as a student. But the reality is that real classrooms not fully Apple embedded are more a pastiche of tools and applications and all of them have their own embedded interests and benefits. In short, there is a lot of fluff in this event presentation, but it’s fluff that’s hard to get too down on because Apple’s vision of an enabled classroom is inspiring as hell. Cynics will say, sells more iPads. Optimists will say, at least someone is trying to drag the average classroom forward into a more creative, polished space. Tim Cook wraps up the event with a speech about how Apple is bundling this vision together with the new iPad, teacher and student tools and coding curriculum. Follow along and refresh this post for more.